My first pocket carry was this pen. I found a pair for about 6 bucks at the local sundries boutique. I lucked out on my first buy. This pen worked great for me for over a year. It has a fairly compact Design. I’ve never had it leak, and its .7mm writing size was perfect. After 9 months or so of usage, I broke the clip off my first pen, and switched to the backup, which I promptly lost. Since I only had one pocket sized pen that was likely low in ink, I thought it was time to start looking for a replacement. I did have trouble finding the F-301 compact at online retailers (until jetpens.com came along). In the meantime I purchased a box of their full size F-301 and use that pen at my desk. I received the space pen as a gift. My initial impression was that the space pen looked solidly built. I like how tight the tolerances appeared when unscrewing the barrel. I didn’t like the medium point size (1.2mm?) but figured I could order a refill in the apppropriate size (turns out you can). I used the space pen for a few days but started to notice an annoying feature of the pen. Because it has no clip and is spherical, it will easily roll off all surfaces that are not perfectly level. This seems like a minor complaint, but in everyday use became quite an issue. 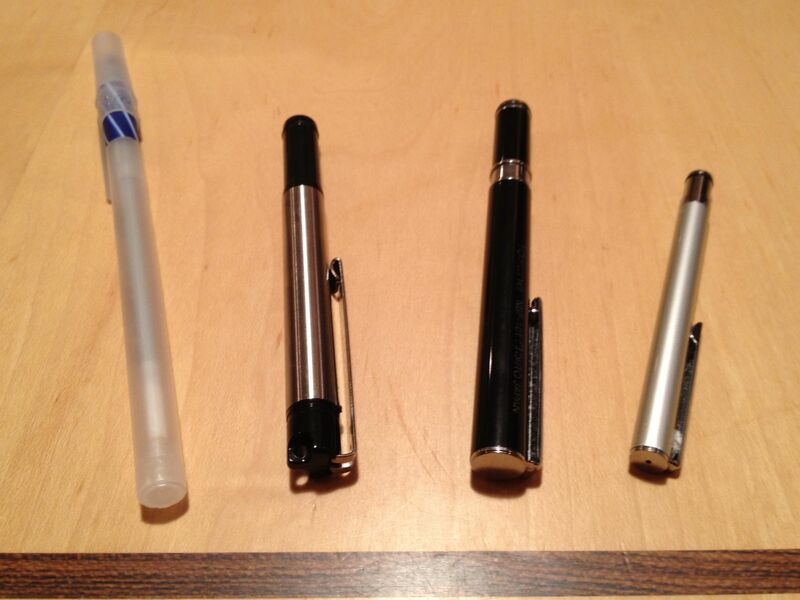 Every time I would return to my desk I was forced to hunt for the wayward pen. After a few weeks of this continual searching (and after almost losing in a hotel room after it fell off the nightstand) I decided to push on in my search for the perfect pen. In fairness I wasn’t often writing under water, upside down, or you know, in space, so the spaciness of the pen was somewhat lost on me. I really like this pen, but unfortunately only in certain applications. As you can see from the photos this is a very small pen. For daily use I would say this pen is too small. The .5mm point size is amazing and I thoroughly enjoy the results of writing with this pen. Unfortunately the result doesn’t compensate for the difficulty of holding this pen in your hand for any length of time. This will be my goto pen for anytime I need to minimize what I’m carrying in my pocket. The pen has dual o-rings locking in the pen when it’s in it’s collapsed configuration. This will help prevent leaks from the pen from ending up on your jeans. One other little oddity I noticed is that if you leave the pen uncapped for a while the roller bar will dry out causing the ink to not flow when you first start writing. I’m presuming this is because of the .5mm point size. 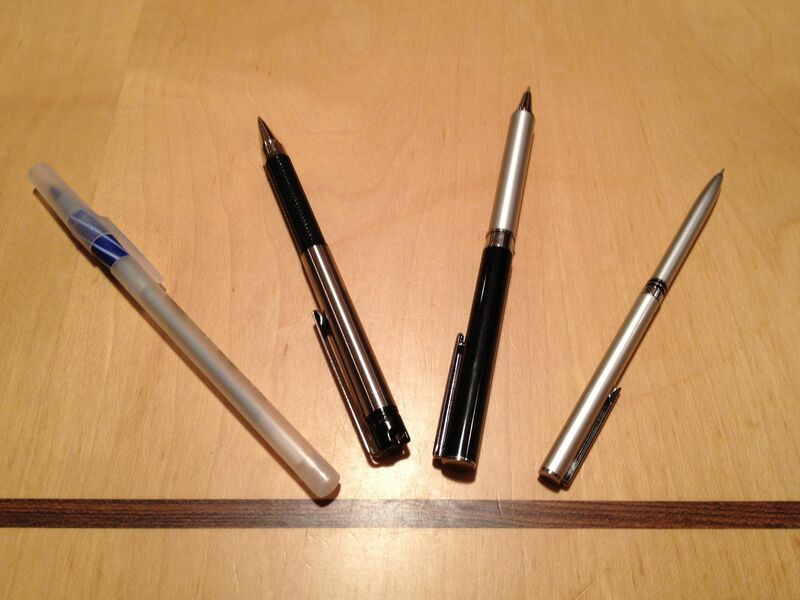 It’s easily solved by capping the pen, but for my everyday pen I want to be able to leave it out between scribblings. This is a great backup pen. This is my new daily carry. It’s a little pricey ($20) for a pocket pen and almost pushes it into the “I’d be sad if I lost it” category, but I’ve found the risk to be worth it. I went with the black and like the stark contrast betwen the black of the pen and my notebook (be it the Red Fall Field Notes, or the plain brown moleskine). It also matches the black iPhone. The .7mm point size is perfect for my writing style. The pen seems reasonably well built to contain leaks. The barrel fits into the cover with a reassuring snap when it is in it’s compact configuration, and slides snugly into the o-ring when it’s open for writing. I have noticed that in the first few weeks the stenciling on the cover is starting to rub off. This isn’t a negative for me as it adds to the rugged charm of the pen itself. One thing I’ve noticed is the sheer number of threads that hole the barrel together. There are some pretty tight tolerances associated with the manufacturing of this pen. Then pen doesn’t unscrew as easily as other compact pens. This is a little frustrating when it comes time to swap out the ink cartridge, but for most of the pen’s life this will be a positive.